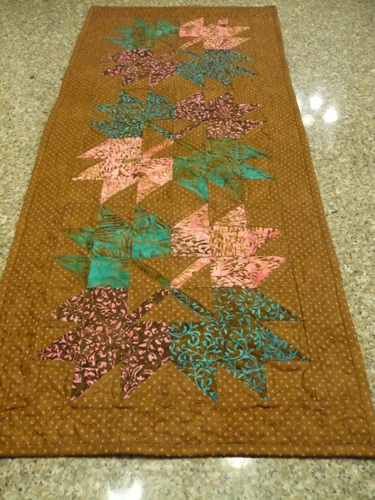 On Saturday I took a class at my local quilt shop on how to make autumn leaves. I love taking classes, learning new techniques, and talking with other quilter. Autumn leaves are so easy!! I had no idea! The class was designed for a wall hanging, and quite frankly my walls are filled with photos of my kiddos, and any empty space is designated for more family photos, so I opted to alter the pattern and make a runner/table topper. 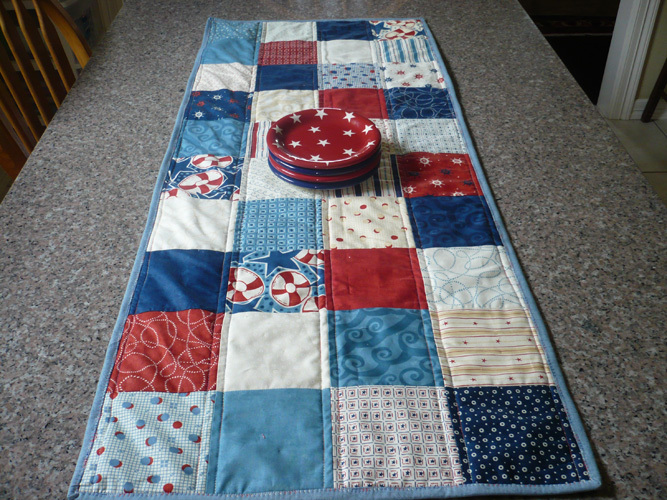 By the way, what is the difference between a runner and a table topper? 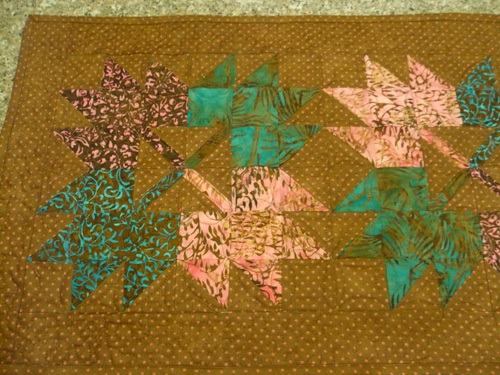 I’m usually not a fan of batiks, but I have had my eye on the pink/brown prints and the blue/brown prints, so I decided to use those, and I absolutely love how it turned out. 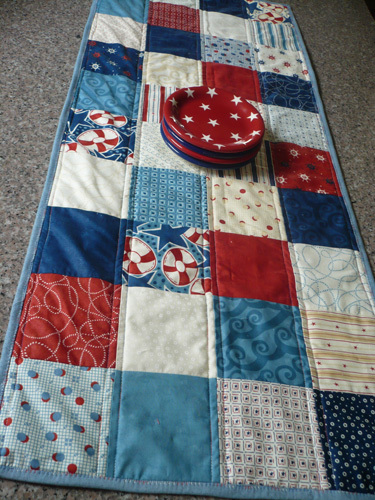 The runner/table topper looks great on my table too, and the dimensions (16 x 39) are perfect for my table–I didn’t want something too big or long as I didn’t want it to hang over the sides. 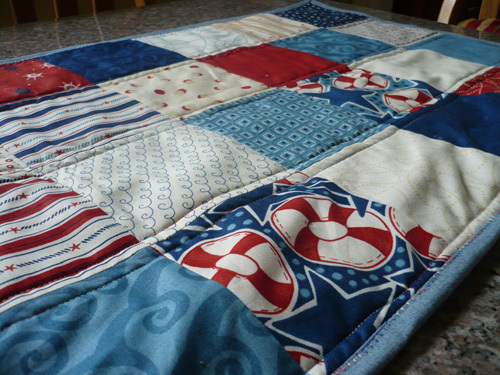 Since I tried a new design, I also wanted to try some new quilting. 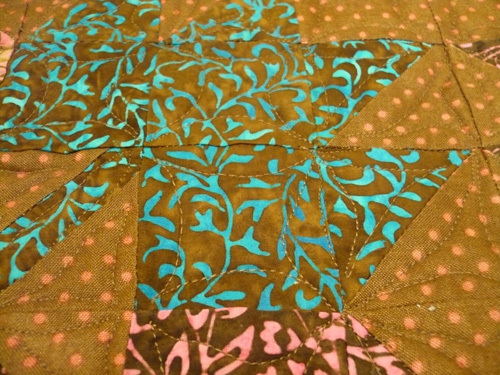 I did stipple the 2 inch border, but the rest of the runner/table topper quilting is so cool…not sure what you call it, but I’m certainly going to do this technique again when I do a quilt of just squares (from charm packs). The intention was for all the lines to be curved, admittedly there are some straighter lines than I would’ve liked, but heck, for the first time, I think it looks great!